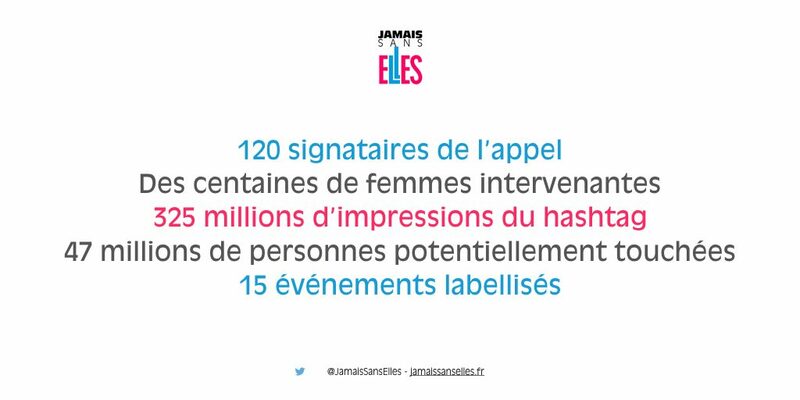 The association #JamaisSansElles, founded in 2016 by female and male entrepreneurs, promotes gender equality through the implementation of concrete actions, and through the individual commitment of the founding members and signatories of the #JamaisSansElles appeal, as well as through raising awareness, in society as a whole and to its leaders, of gender equality issues and the imbalances that prevail in many fields of activity. The first action of supporters of the movement was to commit personally to respecting the letter and spirit of the #JamaisSansElles appeal. Whether they are events organizers or speakers, they ensure that every panel, every round table or conference they attend has at least one woman, otherwise they will simply cancel their participation. Obviously, such a decision is desirable only as a last resort; one of the major strengths of the movement is to enable the establishment of individual and collective dynamics that aim to correct in advance the notorious anomalies likely to present themselves in the organization of this or that event. This virtuous dynamic benefits from the direct involvement of the speakers themselves, who signed the appeal, while at the same time relying on the well-understood interest of the organizers, henceforth more vigilant with regard to better balanced programs. This naturally leads to the readjustment of the programs and to the improvement of the public events concerned. The association #JamaisSansElles enables organizers of public events to avail themselves of the #JamaisSansElles Seal of Approval; through the signing of a charter in which they undertake to respect the spirit of the association and to ensure the active participation of women on their various panels and among their speakers, as well as through the promotion of their expertise and skills. Each round table must have at least one female speaker. 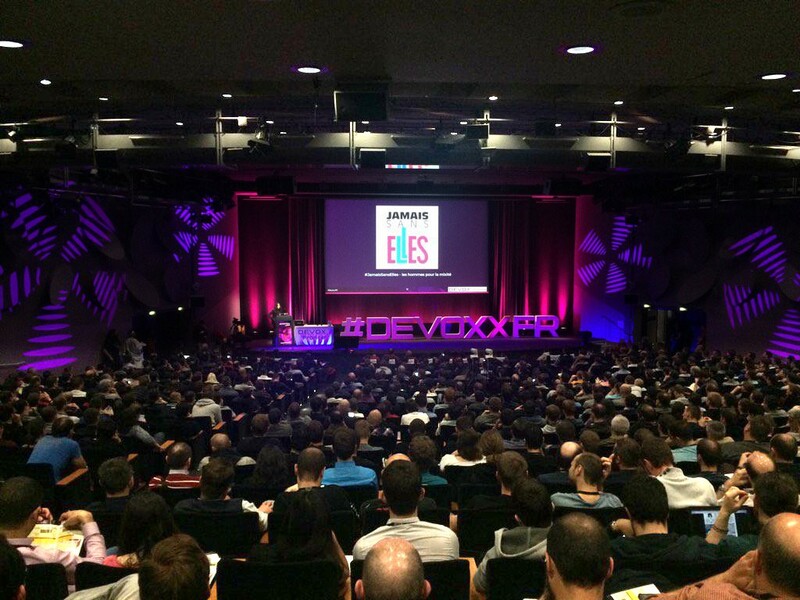 Conference organizers and the media, as well, contact #JamaisSansElles to find speakers. The association has a database but also solicits its Women’s Council, its network of signatories, its community, or associations and networks partners, to propose women with remarkable profiles that are particularly relevant to the topics under discussion. To learn more about certified events. If you would like any information please contact us. 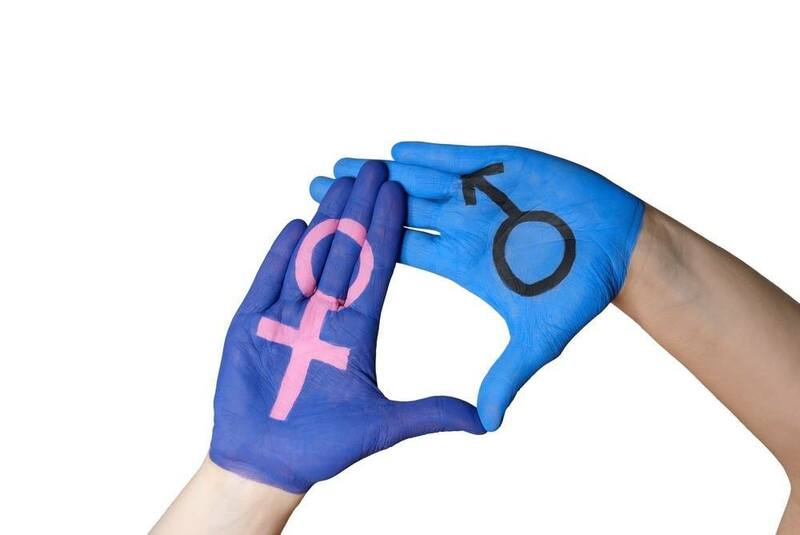 Another field of action of the association #JamaisSansElles is the dissemination of awareness-raising messages, information, articles and ideas that contribute to increasing and promoting awareness of gender equality in public and professional spheres. These actions include the publication of articles and opinion pieces in various newspapers and corporate magazines. 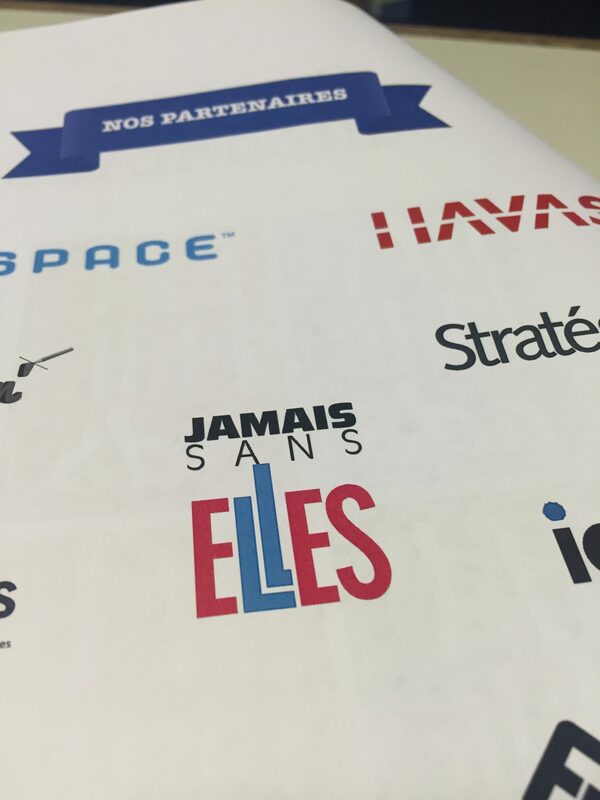 A partnership with L’Express, in particular, enables the founding members of #JamaisSansElles to publish articles regularly with a common theme highlighted by the editorial staff. See the articles and recent opinion pieces. #JamaisSansElles has among its founding members a group of speakers as well who can present and defend the Association’s approach and elucidate the aim and the meaning of the #JamaisSansElle appeal it promotes. The association has spoken in important events throughout France. The awareness-raising action for different audiences on issues of gender equality requires in particular speaking engagments in conferences or public events, as well as appearances on various television and radio programs. In the context of the 2017 presidential elections, #JamaisSansElles proposed a Charter to the candidates so they could commit to defending and promoting gender equality at all levels of the public sphere. Emmanuel Macron and Benoît Hamon signed it on March 8 (see here). 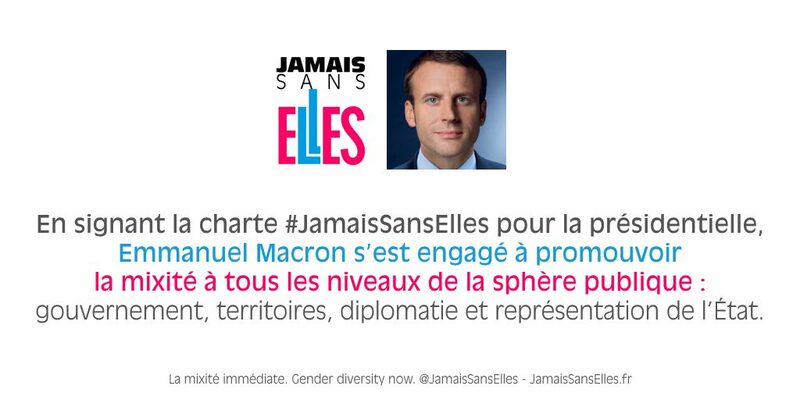 In signing the Charter #JamaisSansElles for the presidential elections, Emmanuel Macron committed to promoting gender equality at all levels of the public sphere: in government, in the territories, in state representation and diplomacy. 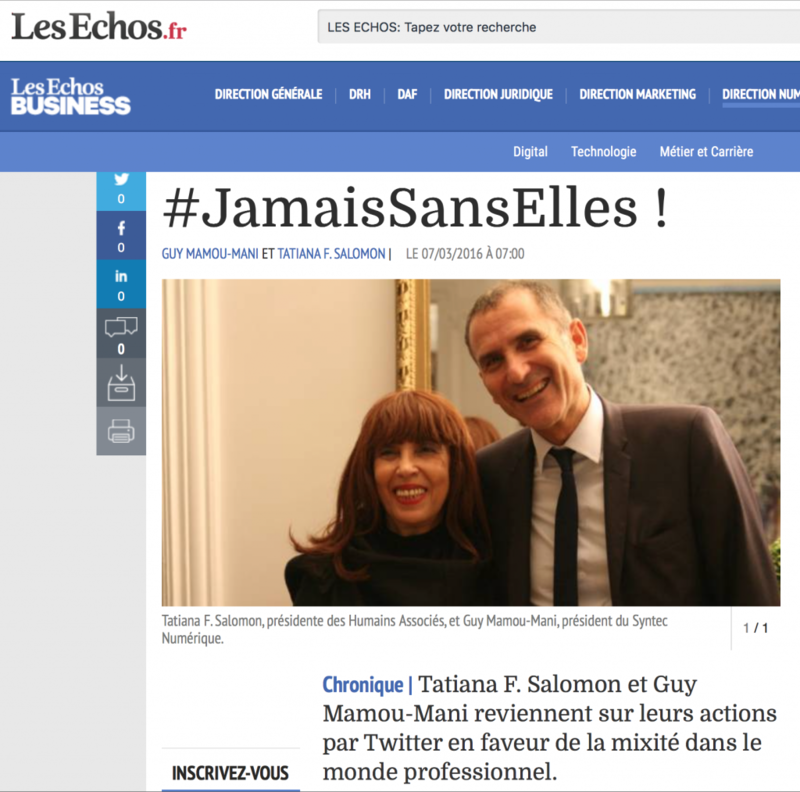 On social networks and more specifically on Twitter, the association shares its finely tuned observation of selected articles and information on gender equality which its community helps disseminate through the hashtag #JamaisSansElles. The selected information is widely shared every day.